Thank you to all who attended and made our 2018 Greater Mekong Forum a success! See all the photos from the event on our Flickr account. Sub-theme 1: Economic Corridoors: Throughout the Greater Mekong, conduits have been created through which trade and exchange can pass, such as the Belt-Road Initiative, or the GMS Sub-region. What are the implications of these initiatives for the region’s rivers and the livelihoods that depend on them? What steps can be taken to ensure that these initiatives can support regional livelihoods and environmental sustainability? Sub-theme 2: Diversity, Rivers and Development: Development initiatives across the region have significant implications at local scales, and can generate significant impacts on women, people with disability, and ethnic minorities. Session under this sub-theme will consider how gender and diversity are impacted, and how women and ethnic minorities can seize the opportunities created by large-scale development. Sub-theme 3: The Entwined Predicaments of Water, Food and Energy: Although the so-called WFE Nexus has been around for some time, its use as an analytical tool in the Greater Mekong has been relatively limited. Nevertheless, exploring the inter-relationships between its facets is highly relevant in the Greater Mekong. This session aims to attract discussions around WFE research, and the discovery of ways in which we can operationalise the idea in analytical and managerial ways. Sub-theme 4: Transforming Energy: Regional electricity production is changing, with moves to source stable supplies from sources other than hydropower. Sessions under this sub-theme will respond to the questions: what are the changes in electricity supply across the region? What do they mean for those regional countries for whom hydropower is central to national development plans? And what are the implications of these changes to the region’s rivers? Sub-theme 5: Innovative Governance: What are the region’s promising water governance opportunities? Sessions in this theme will draw inspiration from promising examples at local, national, transboundary and regional levels, and explore the value of cross border cooperation, at state or local level, for the joint management of water resources. The Forum is not a research conference. It is oriented towards knowledge consumers. We seek sessions designed with this group in mind, recognising that most, if not all, knowledge consumers have no technical background. We emphasise deliberation and listening, whereby participants can query, debate, and (constructively) criticise the ideas or innovations presented. As a consequence, the Forum is also oriented towards participation. In 2018, the Forum is projected to have 300 participants. Half of these are expected to be knowledge producers, and the other half, knowledge users. Application to hold a session at the 2018 Greater Mekong Forum on Water, Land and Ecosystems. Thank you for your interest in holding a session at the 2018 Greater Mekong Forum on Water, Food and Energy. Before applying, applicants should first read the Forum’s Session Guidelines, which can be downloaded from here. We welcome your contributions to the upcoming Forum. Registration to the 2018 Greater Mekong Forum on Water, Land and Ecosystems. 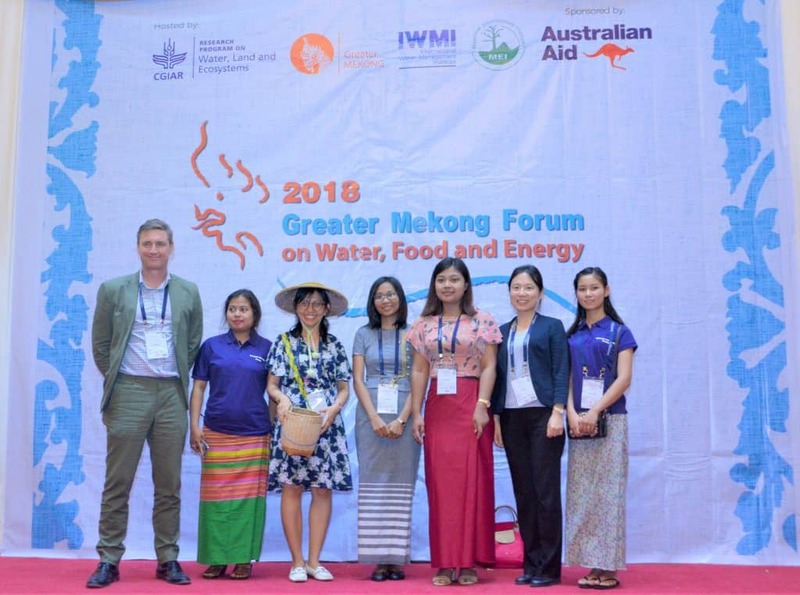 Thank you for your interest in attending at the 2018 Greater Mekong Forum on Water, Food and Energy. How do you intend to pay your registration fees? Participants are welcome to apply for space in the Sharefair. The basic Sharefair package – provided free of charge – comprises a poster board and a display table. If you wish to display other permutations (exhibits, cubicles, several tables/poster boards, etc) please let us know. The latter may involve costs. If you wish to participate in the Sharefair, please send an email to wle-mekong@cgiar.org outlining your requirements. The 2018 Greater Mekong Forum on Water, Food and Energy will be held at the Inya Lake Hotel. We have organised a special rate for forum delegates at the hotel starting at US$65 per night. If you wish to take advantage of this rate, please write to reservation@inyalakehotel.com (copied to phupwinthlaing@inyalakehotel.com), with the subject line “WLE Forum booking request”. Below, we provide alternative accommodation options. If you wish to book a room at any of these hotels, please go to the hotel website or refer to an online hotel booking website. *Under no circumstances whatsoever does WLE Greater Mekong, IWMI, MEI or any other partner to the forum endorse or recommend the use of the hotels identified here. No comment can be made as to the quality of any of these hotels, and delegates are advised to seek on-line reviews and other information regarding these them. **The rates provided are derived from Booking.com on September 12, 2018, and are highly likely to change, and may vary across hotel booking sites. All other citizens require a visa. The simplest way of obtaining this is online, via the Myanmar Government’s eVisa process. Visas cost US$50. Delegate passports must be valid for at least six months after the date of arrival in Myanmar. Before applying for a visa online, make sure that you have an electronic version of your passport photo ready. Typically, processing time will take no more than three days. When you receive your eVisa, you will need to print it off and have the it with you when pass through Yangon International Airport. Click here for further information on visa requirements, or contact the nearest Myanmar diplomatic mission. December weather in Myanmar has average highs around 32 oC, and lows of 19 oC. The weather is likely to be sunny or partly cloudy. In Yangon, the chance of rain in early December is 3%. You should expect to rely on cash for most of your stay. As of September 20, 2018, there were 1,559 Myanmar Kyat to the US Dollar. Visitors bringing in excess of US$10,000 (or equivalent) in foreign currency should declare this to Customs on arrival or risk facing imprisonment. ATMs are widely available. There are three at the Forum venue, the Inya Lake Hotel. An increasing number of hotels, restaurants and shops now accept credit and debit cards. Most vendors will charge a processing fee if you pay by credit card. Once in country, it is easy to exchange US dollars into Kyat. Exchange rates are generally fair. Due to concerns over counterfeit money, dollars with the letters AB and CB at the start of the serial number (top left-hand corner of the note) are not always accepted. Notes with pen marks, folds or tears are also not accepted. Myanmar has multiple mosquito-borne diseases, including dengue. Forum delegates are strongly encouraged to take adequate precautions to avoid being bitten. There is also rabies in Myanmar, and plenty of stray dogs. Delegates are entirely responsible for their health insurance. There is an SOS International Clinic based at the Forum venue, the Inya Lake Hotel. There are many additional sources of information on Myanmar health matters, of which this is one. The Forum organisers in no way endorse the advice provided on the latter or any other site. Tap water is not safe to drink; we suggest you drink bottled or filtered water. Outside established tourist and top-end restaurants, food preparation is not always be as hygienic as you may be used to. Yangon is a large and sprawling city, and you will need transport to get from the Forum venue to the center or town, or tourist attractions. Grab operates in Yangon, for which you must download a mobile App, available here. Otherwise, taxis are widely available and clearly marked. You will need to ask the price from the taxi driver to your destination, and then haggle if you feel that it is unreasonable. It should be noted that Yangon has notoriously bad traffic, and that driving around during rush hour cannot be recommended. Wireless internet is available at the Forum venue, the Inya Lake Hotel. It should be noted, however, that if there are many delegates, wireless speeds may decline to no movement at all. Internet connectivity in Yangon is well known for being poor if not non-existent. As a result, if maintaining a strong and regular relationship with the internet is necessary for delegates, the Forum organisers recommends the purchase of a data compatible SIM card at the airport upon arrival. Multiple companies offer SIM cards at the airport, including Telenor and Ooredoo. Yangon regularly suffers from electricity blackouts, although most hotels have a backup generator. The voltage in Myanmar is 230 volts and the frequency is 50 Hz. The plugs that will work at the hotels are C, D, F and G. Many hotels have multi-purpose outlets that accommodate most plugs. Yangon is generally considered a safe city but delegates may wish to explore other internet travel sites for additional information, such as this one. The CGIAR Research Program on Water, Land and Ecosystems, the International Water Management Institute, the Myanmar Environment Institute, or any other partner or collegiate institution associated with the Forum cannot, under any circumstances, assume responsibility for any injury, illness, theft, death, damage, force majeur, violence or other calamity or difficulty to befall any delegate attending the 2018 Greater Mekong Forum on Water, Food and Energy.